According to Lok, the best bits of the programme were her lecturers. “The teachers at CIMP are a joy to learn from. Their passion and enthusiasm is admirable, sometimes even infectious. I’m very grateful to be able to experience learning under the hands of such passionate tutors. They also offer their time outside of class to help students out,” she said. As with all programmes, Lok said she faced challenges too in keeping up with the deadlines for assignments. As deadlines for various assignments were usually all around the same time, she learned to manage her time well to keep up. Busy as she was with assignments, Lok managed to immerse herself in extra-curricular activities by participating in the Monash Business Investment Challenge, Help International School Model United Nations Ceremony, CIMP track and field club, CIMP fitness club and CIMP Model United Nations. 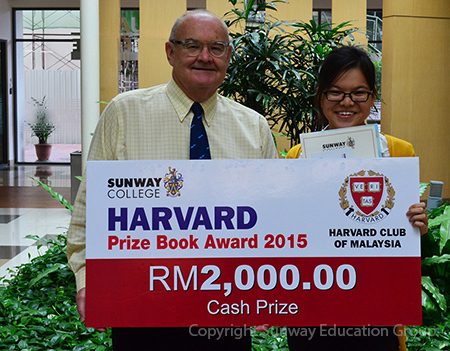 In 2015, Lok was awarded the Harvard Prize Book one of the most prestigious awards for outstanding Pre-University students. Candidates for the award were assessed by a panel of judges from the Harvard Club of Malaysia based on an interview covering social, intellectual and ethical aspects. This year for the interview session, shortlisted candidates were posed with questions which required them to not only think out of the box, but also to think about their responsibility in society, and their roles as citizens of the country. “It was a challenging interview, definitely had me thinking hard, but it was also very fun! Some of the questions were really unorthodox, and the interviewers built up a very casual atmosphere”, said Lok of the interview. “I mostly do tutoring for students who need my help in CIMP. I occasionally volunteer for charity events as well. I tutor 3 days a week; the times I help out for charity events is sporadic, it really depends on my schedule and when the event is being held. Tutoring is really a prime example of ‘the best way to learn, is to teach’, it trains me to explain concepts to others and understand which area of study challenges them the most. I think it really teaches me to be more understanding and tolerant,” said the former student of SMK Bandar Utama Damansara (3), Selangor. 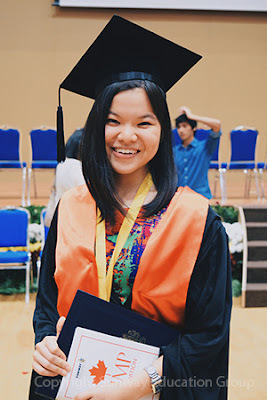 Lok, who will be pursuing further studies in Strategic Finance at Minerva Schools at KGI, California in the United States stated her time in the CIMP programme has definitely helped her grow as a person. “CIMP stresses speaking out, inquiry and independent learning. The teachers are always encouraging students to ask questions, and even if you’re wrong, they don’t embarrass you for it. The teachers are also very accepting of new ideas and opinions, as long as you have sufficient reason, research and proof to back it up. Overall, the CIMP has taught me to nurture my innate curiosity and inquiry, and to be unafraid of thinking outside the box even if it defies the status quo” she explained. She starts her new life the States in September this year with the hope to further her knowledge, meet different people, gain new and practical experiences and become a more global person. “As cliché as it sounds, I’m also hoping to do some soul-searching and cultivate an identity for myself which I shall be truly comfortable with”, said Lok.